Break out the bug spray! 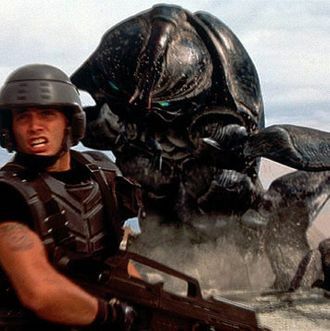 Sony Pictures Über-producer Neal Moritz has decided that the time has come to reboot Paul Verhoeven’s 1997 fascist classic Starship Troopers. He has assigned the script to screenwriters Ashley Edward Miller and Zack Stentz, who, among other things, wrote Thor and X-Men: First Class, as well as many episodes of the TV shows Terminator: The Sarah Connor Chronicles and Fringe. Of course, they also wrote Agent Cody Banks, which makes one think that Frankie Muniz could be the perfect former child star to take over the Neil Patrick Harris role. A new Starship Troopers follows remake plans for Verhoeven’s Total Recall and RoboCop. How long until his Basic Instinct and Showgirls get updated? Come to think of it, we could totally see Frankie Muniz in both of those, too.